/ What Would Einstein Say About Autism Today? 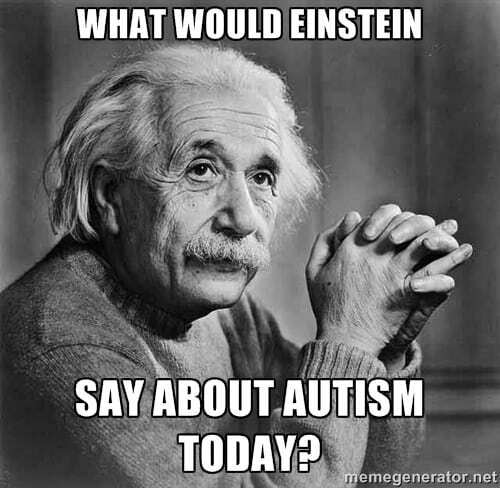 What Would Einstein Say About Autism Today? You don’t know how long I’ve been waiting to say these words to those affected by autism. There are no words I can even conceive of to express my deepest concerns to those who are challenged with autism. For some people it has been a tragedy, yet for others it is considered a gift. But for all of humanity it is time we came to understand autism from the relativity of time. To help me explain this I needed someone who would explore my theory of relativity and make their own great discoveries. I knew it would have to be someone like me, on the autism spectrum. Actually when you think about it, many of us are on the spectrum, be it even on the most miniscule level, because very few people’s minds perform at optimal perfection. Once you understand autism from a new perspective you will appreciate your own differences for what they really are. Furthermore and most importantly we get to respect each and every other person’s differences in a whole new way. So from here I have to leave it up to my brilliant friends Bushy Van Eck, Author of Prisoners of Our Minds, member of Mensa, with an IQ higher than most college professors, and his friend Clayton to help us understand autism from the relativity of time. By understanding autism from the relativity of time, you will understand how it can be a tragedy for some people as well as a gift to others. I have been ridiculed most of my life for being different. I have felt both gifted and tormented at the same time. I became obsessed searching for the answer as to why my mind works so differently than others. My research is based on scientific data as well as my own observations and conclusions. For me my dream has come true, getting the answers I was looking for. Please don’t worry if you do not understand everything you are about to read, for it took me over 25 years to make this discovery. Have you ever noticed it seems like the oddballs of the world help move us forward the most? For some people one profound moment of clarity opens them up to a whole new world of knowledge and takes them to a higher level of existence. I believe we are truly on the brink to this new expansion. It happened for me and I know it can happen for you too if you give it a chance. When I set out to discover the truth behind our existence, so many years ago, I certainly ended up getting more than I bargained for. I truly hope I can help you have one of those “Moments of Clarity” and it brings new meaning to your life and those around you a whole new way. When someone is interested in something they tend to want to learn more. Every person who opens their heart and mind can learn something that will have a deep impact in your own life. You can gain a new respect for autistic people, now having infinite empathy because you understand how it can be a tragedy for some people as well as a gift to others. We will now be able to respect each other’s experiences, struggles and opinions no longer offending one an other. Because my intention is to make this simple and easy to understand, I am not going to clutter you with a lot of big scientific definitions but will include links for clarification. Once you gain a basic understanding of this theory, it may become an instant realization that was always right in front of you but never explained in a meaningful way. Just like we all have our own personal finger print, the same goes for our minds. To help us understand autism and how it relates to time we need to understand what a unit of time is and what a moment of awareness entails. For most of us we know what a minute of time feels like. But why does time seem to go by faster as we age and slower when we are younger? How do our minds use up more time? And the most important question is: How can time perception problems help explain autism symptoms? Think of time as a sequencing of units. These units are called Planck Units in Physics. Each Planck unit is equal to 1 bit of data (or information or knowledge); these bits of data form sounds, words, colors, thoughts, touch, etc. into moments of awareness. In other words it takes so many required units of time, depending on the substance, to form a moment of awareness. Read this paragraph over and over until it sinks in deep into your psyche, the human soul, mind, or spirit. Enhanced Motion Perception in Autism May Point to an Underlying Cause of the Disorder Now back to understanding autism in a meaningful way so that you will be able to make sense of most new related research. How can an autistic person “see faster”? All of the data or units of time and information is first processed in the subconscious mind. Our subconscious mind is where it all takes place and for an average person the processing speed of data is very similar in performance. But what happens when the data is being passed on to the conscious mind too fast or too slow, or by too much or too little? For example, you are receiving too many sound bites of data. It will create havoc for a person’s sense of sound hearing all the voices in a room all at once. The same would go for any perception of touch, sound, sight, thought and so on. Once you get to conceptualize my theory you will be able to apply it to many mental differences. You will understand people in a whole new way realizing our brains all work slightly differently and enabling you to appreciate and respect that we are all different. Do you know someone who seems to always talk faster than you? Does the waiter or waitress seem to be on another time scale: -too slow or even too fast but never realizing it? Do you answer a ringing phone so quick it surprises the caller? You may be hearing sound slightly faster. The analogies are endless once you have a clear understanding of this theory. Right now from this very moment of awareness you will notice a whole new world. Things about people you never noticed you will see and understand clearly. And it will change you forever. You will become much more empathetic and your humility will become limitless. An abundance of information at the subconscious level, when not being sorted for relevancy to the situation with the rest being disposed of, will cause an overflow of data onto the conscious awareness. Your conscious mind will literally be drowning in data, suffocating you in information, literally slowing the world down around you. During such a moment an autistic child will literally hear every word of every conversation, smell every fruit on every shelf, see every move of every motion, and feel the wind pushing him. It’s like time is standing still, being frozen up in the moment. A baby’s brain at birth is around half the size of an adult’s brain. As such the baby’s mind would encapsulate time to last twice as long as that of his parent and therefore would perceive each and every movement, every single sound and every touch, to be lasting twice as long hence everything being very slow in the mind of the baby. For more on this read Autism and Head Size Study. When the brain of an autistic child develops too quickly, the whole scenario around him changes. Everything around him which was supposed to be transpiring at a very slow rate enabling him to follow through is now happening way too fast for him to comprehend, literally stripping precious time from his mind. Our every move, sound and even touch would become no less than terrifying for his now almost adult mind, a mind still in dire need of the relevant data and know how to help him make sense of the world around him. I believe there is much that can be done to rectify time perception simply by knowing how to manipulate awareness of time and steering it in the right direction. This can be achieved by means of virtual realities and the administration of very precise doses of task specific drugs directly related to the metabolic rates to bridge this problem during the important developmental stages. Some of the work of Bill Mueller is directly addressing issues with over sensitivity to sound. It is my deepest intention to open up new ideas to help solve the struggles related with autism. It is generally considered that the sensory inflow to the neural system is cut into fragments, which then are bidden to each other, based on their features, to result in sensory perception. This idea is supported by flicker-fusion of visual images, when perception of continuous movement might be provided by a series of fixed visual frames. No man has nor ever will be capable of any profound discovery no matter how small, without having trampled upon the hard built foundations constructed from the blood sweat and tears of others. Not even Einstein could claim otherwise. Only by gaining a fundamental understanding of Time, Space and Energy, based on pure logical reasoning will you be capable of understanding what the true realities of the Present, Past and Future really entail, being responsible for our perceived realities. Any one moment of awareness can never consist of anything less than an equal duration of the present, past and future no matter how long or short that duration might be. Take careful note of the following statement which is fundamental in getting to understand the true realities of our existence, especially if you eventually want to gain a complete understanding of autism. The only way possible to see into the future is by living in the past of which the present moment has already occurred. Only by coming to understand this is it possible to understand the true nature of our realities. The transitional gates of our minds are responsible for the transformation of consciousness into any one single moment of awareness, of which the metabolic rates plays a critical role. It is these transitional gates which are responsible for safeguarding us from the harsh realities of our physical interaction at the subconscious level constrained to a different level of time perception. Yet these transitional gates for various reasons are quite often compromised causing all types of phenomena resulting in the likes of autism, aspergers, ADHD, sleep Paralysis, déjà vu, bipolar disorders, multiple personalities, schizophrenia, seizures and the list goes on. Although our realities are not that difficult to understand, there certainly is much more to be learned to gain a clear understanding thereof. What you, the reader, has been exposed to so far is merely a taste of what our realities consist of. There are numerous mind blowing facts that will change the way you think and behave forever, for once the door is opened it can never be closed. Bushy Van Eck has spent his entire adult life working on his theory. Although being ignored by some, he has never given up hope to share his theory. Bushy was born and raised in Brakpan, South Africa. The school systems of the 1960’s and 1970’s in South Africa had no place for a gifted child. What he was especially ridiculed for even until this day is his lack of handwriting skills, writing he can mostly not even read himself. Bushy took on a normal life and a normal job until the internet allowed him to become self taught in Physics and much more. I have had the privilege to study and learn his theory. If you have read books like The Secret, The Law of Attraction and hundreds of other self-help books but still felt something was missing, Bushy’s work can help fill that gap. Bushy is honored to be included this summer in the filming of the US Autism Road Tour. There are no words that can express our gratitude to all the supporters, especially those affected by autism. No theory that can expand our understanding of autism should be ignored, for that could be an injustice to those who need it the most. Please give Bushy your support by following our Facebook page ImAutisticToo. Clayton Ulrich Nuckelt is a creative writer and promoter of the “The Ultimate Understanding of the Human Existence” a collaborative effort of Bushy Van Eck’s Theory of Time. Although he has a degree in marketing and worked in the fresh produce industry for many years, he has always had a passionate desire to work in the humanitarian fields. He has held the belief that no child should ever suffer from inhuman actions and that humanity is responsible to itself. Proud Husband, Father of six and Grandfather of three, Clayton currently resides in Indiana and was raised in Southern California where he gained vast amount of exposure to many different cultural and spiritual beliefs. I am trying to understand the positions of the person who wrote this article and also the replies, but am struggling to. I think there may be something to the idea that time perception is something to do with age, but think this has lttle or nothing to do with relativity. I also think it would be a mistake to reject all the foregoing out of hand on a wave of indignation. I do agree that cult thinking can be destructive and dangerous, but I’m not sure this is it. Having said that, I think there is a link to perceptual differences and autism and asperger’s. This seems as yet unclear, though I have seen elsewhere a theory that polytropism (multiple processing simultaneously) is a sign of neurotypicality and monotropism (single processing) is a sign of an autistic spectrum condition. It was interesting how the article author seemed to notice that concentrating on a few things or one thing can be a sign of asperger’s.. That this could be linked to time perception could be an avenue worth exploring further, though I do agree that links to theories of physics like relativity are somewhat tenuous at best with the current state of knowledge. I do feel – and it is just a hunch – that there could be a connection between emotional state, levels of concentration and time perception. However the details of this I am not clear on. That ascs could make a difference to perception of of time due to different modes of perceiving and concentration is an interesting hypothesis to begin with which may warrant further investigation. Although I do admit that some of the foregoing article seemed wrapped in a certain amount of pseudo science, there could also be some truth in what he said.worth thinking about too. The writer has no grasp of reality. Einstein was interested in science not the study of the human mind. It is a huge leap between “time slows down as you approach the speed of light” and the well touted idea that time goes faster as you get older. Come on! I subscribed to this site for useful information on autism; not someones self admiring quack theories. The writer is an intellectual snob. Autistic people are different to the general population that is true, but the perspective of elitist fuddling of so called facts sounds like the selling of a cult membership, and has nothing to do with understanding autism. Quite naturally I expect the author to disagree, considering they are are a self confessed smart person. Actually, I agree; they are smart, smart enough to get the admin of this site to include this insulting self validated rubbish. And finally, don’t make the mistake of thinking that trying to take advantage of the vulnerability of autistic people will be to your advantage. We spot the details. And you are missing something. Read your own article again. Maybe you will see it. Admin post this if you respect the autistic community.